There are many grades of tonearm cable on the market. We have listened to literally hundreds of tonearm cable variations, both from other manufacturers and different prototypes of our own. Some cables are so poor they wreck the performance of a tonearm simply by robbing the bass and giving a “transparent” but overly bright tonal balance. Others may have a nice tonal balance but sound woolly and lack definition. The list of characteristics is lengthy but the two aforementioned examples give the general idea. It is surprising that even expensive tonearms often have cables which can be significantly improved upon. For many years enthusiasts have improved their sound quality by upgrading their arm cables. However finding the best cables is not easy amidst a myriad of options. This article offers information on some of the best tonearm wires on the market which we make available to all tonearm owners whatever the brand. The dramatic improvement that a good arm cable brings often shocks people as the reviews on this site show. So why is this? Tonearm cable is a highly specialist area because the signal levels involved are approximately 1000 times lower than those for normal interconnect cable. For this reason the signal magnification is far higher than any other part of the system. The quality and design of the cable also needs to be different to a normal interconnect. Subjectively it’s notable that better arm wires have much more impact than better interconnects – by a phenomenal margin with the very top cables (not necessarily price related). If you are not familiar with the intracasies of tonearm wiring it helps to understand things by breaking the wiring into component parts each of which influence sound quality. Headshell Wires – should be continuous with the internal wiring to avoid joints which slightly degrade performance. On many arms this is not the case. Internal Wiring – needs to be relatively thin and flexible to minimize resistance to movement and reduce friction. Mechanical flexibility means that an electrically optimum cable cannot be used as these are generaly have more strands and are thicker. Connection to External Cable – Because external cable it shielded there needs to be some form of transition so there internal wires can be continous and become external but with a shield added. Or they can be soldered to the external wires inside the base of the arm (hard wired). Or they can have a mechanical connector, the most common being a 5 Din pin. All external cables (except Standard) can be fitted to any brand of tonearm if it has a 5 DIN pin fitting in the base of the arm. All external cables can be directly soldered to Origin Live or Rega arms – this yields superior performance to 5 Din pin and is included in the price. Note: The cables on this page are for upgrading existing tonearms and include fitting of 5 Din Pin or soldering. What Does a Pure Transmission Cable Do? If you’ve ruled out upgrading your arm, believing it’s already good enough, or too costly to change then we suggest you think again. Many people think they need a cartridge upgrade when they really need a tonearm upgrade. It’s proven that this can be even more significant. It also means you can run with a less costly cartridge whilst improving performance. Over a period of several cartridge replacements, this results in a tremendous saving. Tonearm cable upgrades are a great investment and can be carried out on most brands of arm including our own. Dr Stephen F. Worrall. MD, FRCS, FDSRCS. “I just wanted to say a big thank you to you & your team for the fantastic upgrade. I was not expecting such a large improvement & just wanted to let you know how much better my system sounds now. The first thing I noticed was how much lower the noise floor of my system has become (I didn’t think I had a problem with this but the new wiring loom has proved that there was noise present in my system). When the music started I was well shocked, the sound stage filled my whole room & as I carried on playing my records the biggest improvement was the sound of anything being hit, it just sounded so much better (the leading edge of any note is so much clearer) drums, triangles, bells, even the little’s hammers in a piano just sound so right now. The only problem I have is trying to explain how much of an upgrade this is. I feel I cannot describe the vast improvements that have been added to every area of my system. Most people would not anticipate the level of upgrade to be made by just changing the output leads and arm tube. Do You Need Help Choosing a Cable? I have read many Hi-Fi magazines per month for many years and see countless cable reviews. As a cable designer with years of experience in the field, it has become all too apparent that this subject needs a lot of clarification. Origin Live’s very first product was a cable. In fact, back then in 1986 the company was known as “Cable Design”. Is Cable Choice a Lottery? Finding the best cable for your system can be like a shot in the dark. Some users have to try numerous cables before finally getting the results they want. Without meaning to sound arrogant I would suggest that reviews and specifications need a lot of help in their interpretation for reasons which will become clear later on. Origin Live don’t offer a cable to suite every system and we do not believe that there is such a thing as “the best cable”. We do believe however that there is “a best cable for your system”. This article provides plain talk that could save you a great deal of time and money. At quite a few Hi-Fi shows I have been accosted by sales representatives extolling the wonders of a new cable that we “must” try in our system and be “blown away”. Not being completely cynical, we usually give them a whirl. The interesting thing is that in spite of sometimes consisting of solid silver and costing many times more, we have only found one of these offerings superior and this was 11 times the cost. I hasten to add that auditioning was by impartial consensus, as we usually have non-staff present in the comparisons. This story is not to say that most cables offered are poor but rather to illustrate that no cable will ever suite all systems. In the world of Hi-Fi equipment, cables seem to be one of the most system dependent items by a colossal margin which is one reason we hardly ever submit ours for review. If you’ve read cable reviews, you will be familiar with various theories about their design. Before commenting on various cable philosophies you may want to know a little of our background for credibility. Origin Live started in 1986 by designing the very first solid core cable ever produced specifically for Hi-Fi. This cable continues to be a fantastic cable for valve amplifiers and only a month ago replaced the “reference” cable used in a reviewers system. We later developed highly configured stranded cables and Litz wires. Walrus Hi-Fi described our cables as “the best kept secret in Hi-Fi”. These comments should allay fears that the following comments are merely fanciful ideas. Cables are highly controversial so let’s consider a few dogmas. Silver is the best material for conductors in the cable? Silver wire seems to increase clarity, sometimes remarkably. However it can also sound rather harsh and bright in the wrong system so one has to be careful. The odds are that it’s much more likely to work well with valve amplifiers than solid state, but other than this, it’s hard to say much except that in plugs and sockets, Silver seems to invariably sound the best. PTFE is the best insulation material? PTFE has the best figures for practical insulation (apart from air or a vacuum). However, we have found it is not necessarily the best dielectric to use in cables – testing shows that it shifts the tonal balance towards brightness along with a reduction in bass weight. This can be accounted for in the way that dielectric properties vary with frequency. There are materials that seem to transmit more evenly across the whole audio frequency band. As we’ve already discussed, cables are very system-dependent, so any cable review that doesn’t mention the system used is of questionable value. As you will read in a moment, you can glean a certain amount of useful information from a cable review if you know the context. The most fundamental difference between cables is whether the conductor cores are twisted or run parallel with one another. Your system will have a clear preference for one of these 2 types of cable. So when you compare cables, start by comparing a flat cable to a twisted one, rather than a whole range of say, flat cables. Once you know your system preference, you have immediately narrowed down the field massively. Twisted cables offer a lower inductance load, which is generally considered a good thing from a theoretical stance. However, flat cables can sound better in certain contexts and have the attraction that they can more easily be fitted under carpets. If you are after the best sound don’t let this convenience sway you. A twisted cable can make a dramatic difference. Subjectively, twisted cables bring the midrange forward and tighten up the bass. Spacing the conductors further apart and not twisting them has the opposite effect – they give the bass a more relaxed feel with longer decay of notes. Knowing this simple fact can help you correct a system imbalance by matching it to a more suitable cable. If you have valve amps, you should almost certainly choose twisted cable as this will tighten the bass by reducing the inductance load. Valve amps are notoriously load sensitive which is one reason this works. Certain amps like Naim, Exposure, and Linn have been designed for use with dumbell cables (flat & spaced) – it’s usually best to stick with flat cables for these amps to give best sonic results. More importantly you can invalidate the manufacturer warranty by using a non-recommended cable. Higher performing amps tend to use less negative feedback and sound better with the easier load of twisted cables. For example most Class A amps will prefer twisted cables. Sometimes the above guidelines are invalidated because an amplifier or loudspeaker response is not even. For example if your system gives a very forward sound in the mid-band, you may find that a dumbell configuration works best. You should be aware that this is a tricky area where there are many exceptions to the rules. The best policy is to experiment between the 2 types of cable, and this should leave you in no doubt as to which is best for you. Stranded, Litz or Solid Core? 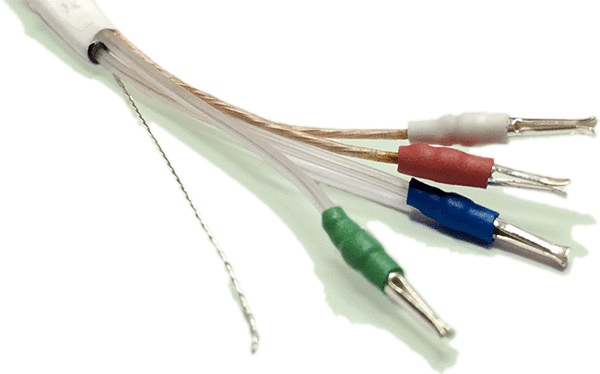 Most cables consist of thin strands of wire bunched together to form 2 conductive cores. However there are alternatives in the form of “Litz” and “solid core”. If you don’t know what Litz wire is, then it’s best described as a bunch of thin wire strands within a conductor, in which every strand is individually insulated from it’s neighbour. Favoured in many high-end cables, this configuration has the advantage of completely eliminating signal degradation caused by electricity jumping from strand to strand as it passes along the cable. Electricity “jumps” in normal stranded cable because it travels the quickest path. The bunched strands making up the cable do not run straight, but have a light twist to hold them together for manufacturing reasons. This twist causes “jumping” but any bend in the cable will have a similar effect. As one might expect, elimination of the jumping effect manifests itself in a very pure sound, devoid of grain and background haze. A well designed Litz wire always seems to perform well as an interconnect. However for speaker cables it is not as consistent, perhaps because it presents a higher impedance for low frequencies. On account of this, it’s best avoided as a speaker cable on valve and low power amplifiers. For anything over 40 Watts solid state, a Litz cable can be a huge advantage. Solid Core cable is usually a single, relatively thick conductor instead of a bunch of thin strands. Similar to Litz, there is no signal degradation caused by electricity jumping across boundaries and as you would expect, the sound is pure and transparent. The tonal balance of a solid core wire is affected by the thickness of it’s core. Thin solid core wires (less than 0.5 sq. mm cross-section) are highly transparent but bass light, thick solid cores on the other hand are bass heavy (2.5 sq. mm cross-section 30 amp mains wire) – mains wire with conductor cross-section of 1 sq. mm is about right for many systems and still popular in some quarters. A large diameter solid core wire such as Origin Live Soli-Core is highly favoured by valve amp users. No one really seems to know exactly why thick twisted solid core wire works so well on valves but it outperforms exotic alternatives including Litz wires. Plugs are influential on sound – yes, dare I say it, they are surprisingly audible. Different plugs influence the sonic characteristics of a cable significantly. Plug design is worthy of a separate article so I’ll save this for a later date. We are meticulous when it comes to sound quality and the fact that a plug is made from copper as opposed to brass is just the start. In a future bulletin we’ll look at the results of testing 4 copper plugs made by WBT, Furutech, Harmony and ETI. We have only hinted here at some of the research conducted into cables but hopefully this article is of some help. Always allow at least a couple of hours break in time for cable tests but 40 hours to be sure. Claims regarding metal purity and crystal structure are important but of little account if the cable configuration and a whole range of other things are not right for your system. Cable comparisons must be carried out in your system or they are of little value. Don’t pay too much attention to the hype in brochures or reviews – my first introduction to cable comparison was with a highly reviewed £8/meter Oxygen free, high pressure wound cable (pressure winding reduces strand vibration and “jumping”) against a £0.32p/metre mains wire. The mains wire won hands down in a very standard system. Only one topic is usually discussed at a time.